Isagenix IsaFruits is loaded with essential nutrients to promote health and mental performance. Superfruits like acai berry, mangosteen, noni, pomegranate, and wolfberry. These are cold-processed to keep the primary active ingredients intact. Simply add to water or your favorite shake and enjoy! 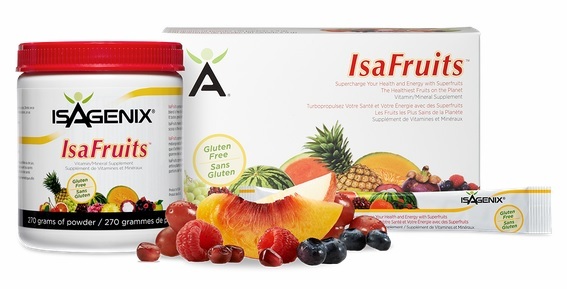 How Do I Buy Isagenix IsaFruits in Canada? RECOMMENDED: Sign up and Save (CA$37) — Sign up to the Isagenix auto-ship program to become eligible to have access to the cheapest wholesale prices. At the end of the checkout process, you’ll be asked to set up your next month’s order. Autoship can be canceled at any time, even after you take advantage of the cheaper prices on your first order! There are no locked in contracts of any sort. Plus, this gives you the opportunity to participate in the Isagenix business (this is 100% optional). Full Retail (CA$49.33) — If you prefer not to sign up and take advantage of the lower pricing, you can purchase the products at the full retail price. This is not recommended as you can cancel auto-ship at any time. Your first order with IsaAxcess is covered by a product money back guarantee within 30 days. If you’re not completely satisfied with your Isagenix IsaFruits, send them back to Isagenix Canada for a refund! What are the Ingredients in IsaFruits? To see the full list of ingredients, download the IsaFruits List of Ingredients here. 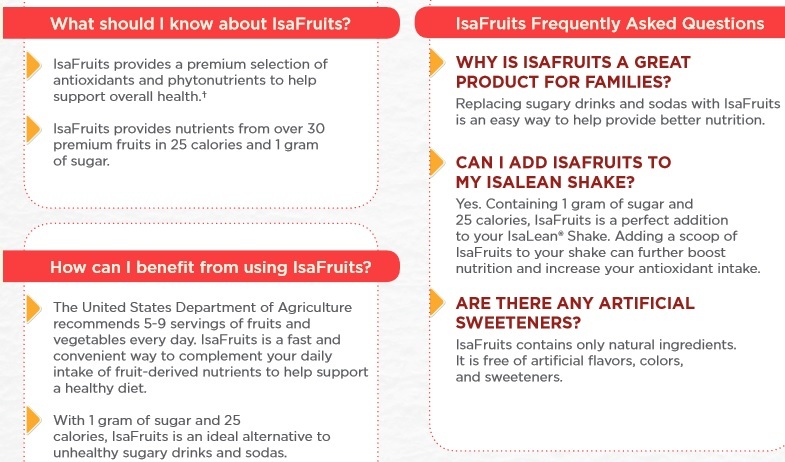 Download the IsaFruits Product Information Sheet, or contact us and we’ll happily assist you.